Feel the fresh sea breeze caress your skin as you surf, yacht or just lie on the beach with the Liberty Lifestyle Marine Pour Homme. The youthful, marine notes of the perfume bring in a feeling of bracing freshness of citrus and mint and exhilaration of violet and cedarwood. About the brand: Ace footwear maker, Liberty shoes has forayed into a lifestyle division with its new venture 'Liberty Lifestyle'. The brand has introduced its first range of luxurious fragrances and grooming skin care products that would appeal to the millennial consumer. The Eau de Parfum collection consists of twelve long lasting and aromatic fragrances that will surely enthrall your senses. Explore the entire range of Perfumes (EDT & EDP) available on Nykaa. Shop more LIBERTY products here. Explore the entire range of Perfumes (EDT & EDP) available on Nykaa. 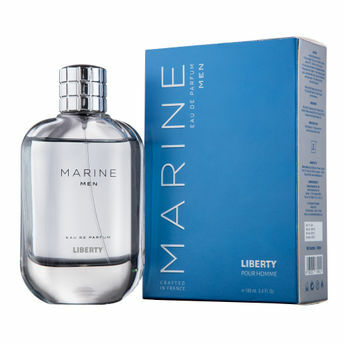 Shop more LIBERTY products here.You can browse through the complete world of LIBERTY Perfumes (EDT & EDP) . Name of Mfg / Importer / Brand: Vanesa Costmetics Pvt Ltd.